How often should your son or daughter use technology in the classroom? What are the pros and cons of inviting children to engage in technology learning versus hands-on learning? How much screen time is safe for young children? And what do Montessori schools do to strike the right balance? As a parent who cares deeply about giving your child a rich, meaningful education, you probably have many questions about how Montessori schools handle technology. You want your child to benefit from technology, without overusing it. And so do we! We believe that giving your child a strong Montessori education means balancing technology with creative, hands-on learning to yield the best of both worlds. 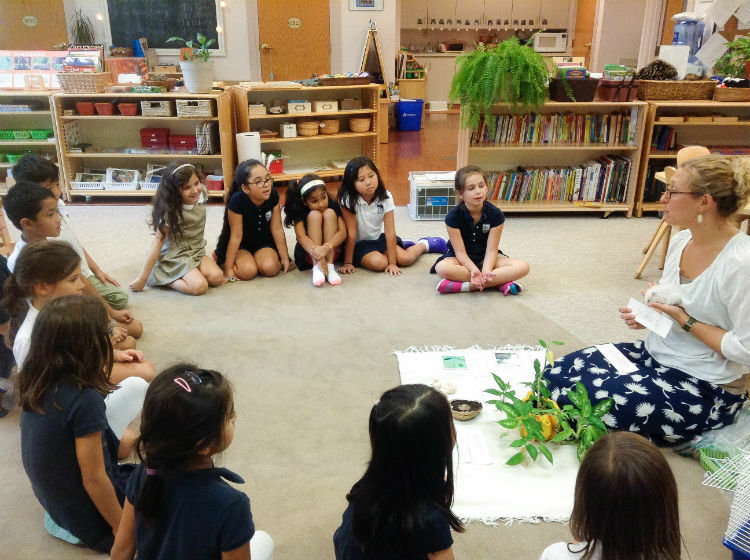 Here at Primary Montessori Day School, our chief goal is to equip your child for lifelong success. We want to help ensure your son or daughter develops the curiosity, leadership skills, confidence, follow-through, and love for learning that drive accomplishments for years to come. So, when it comes to deciding when to use technology in the classroom — and when not to use it — we are led by one key issue: Will using technology in this situation be meaningful and purposeful? Or will learning be enhanced if the child does not use tech in this instance? Everything we do stems from the answer to this question. According to the American Academy of Pediatrics (AAP), there are many reasons to restrict the amount of time young children spend online consuming media. Studies show that the risks to young children of spending too many hours in front of a display screen can include obesity, sleep disturbances, lack of meaningful real-life relationships, poor academic performance, and other issues that can affect their success in school and in life. To combat these issues, the AAP recommends setting consistent limits on the use of technology and media, as well as designating media-free times to balance out your child’s use of technology. At the Primary Montessori Day School, we honor the AAP guidelines as well as the Montessori method by limiting both the use of interactive and passive technology at the school during school hours and in before or after-care programs. In our Montessori classrooms, technology use is limited to typing and research—freeing students to learn through discovery. Of course, setting limits on the use of technology is only one side of the issue. It is also beneficial to plan educational activities that invite children to use a full range of skill sets that can help them later in life, such as brainstorming, exploration, experimentation, and socialization. By limiting screen time, Primary Montessori students enjoy freely engaging in hands-on learning which helps them develop a sense of curiosity and exploration. When children work at their own speed on activities they are intrigued by, they discover their passions and strengths, and they learn discipline and persistence. By encouraging face-to-face social interactions rather than online screen time, our classrooms provide ample opportunities for your son or daughter to practice social skills, gain empathy for others, learn teamwork, and develop leadership skills. Your child also learns to pay attention to everything the world has to offer, focusing on the opportunities for growth, fun, and joy all around them. Choose and communicate what media behaviors are appropriate for your child. Set consistent limits on how many hours per day your child can use various technologies. Ensure that your child gets at least 1 hour of physical activity each day, and 8 or more hours of sleep each night. Remove TVs, phones, and other technology from bedrooms. Make sure that everyone who cares for your child — family members, babysitters, etc. — know your family’s rules and limits for technology use so that they can follow them when they are with your child. Talk with your child regularly about appropriate online behaviors and safety. Engage in activities with your child that don’t require technology — such as cooking together, gardening together, and spending time together at the park— to foster a strong, healthy relationship. At Primary Montessori Day School, we love to help parents and children grow together in ways that bring about success in life for your child. And we’re always happy to answer questions about issues like how we balance today’s technology with hands-on discovery and exploration to help your child enjoy a great education that benefits them for life. So, if you want to learn more about the Montessori approach to education or are wondering if it’s right for your child, we invite you to download our free informational booklet, “How Montessori Gives Your Child a Balanced Education—at School and at Home.” It answers many common questions that parents have about the benefits of Montessori and explains how you can bring those benefits into your everyday interactions with your child. Download your free copy of “How Montessori Gives Your Child a Balanced Education—at School and at Home” today — and see how Montessori offers your child so much more than a traditional education.